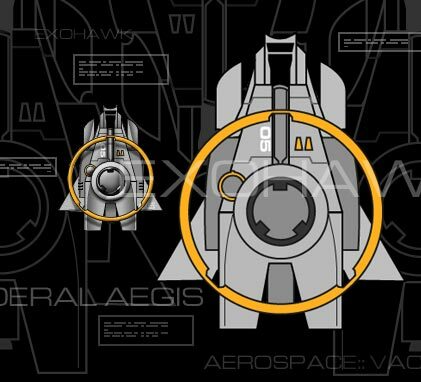 The player craft is the latest and greatest piece of ultra tech in the Federal Aegis arsenal, the Exohawk. The Exohawk can operate in vacuum as well as atmosphere and in both normal and hazardous(i.e. nuclear or toxic) environments. The Exohawk is loaded for bear with an assortment of "dumb" gatling weapons, "smart" rifle darts and ECM to confuse enemy "smart" rounds. Bosses in KETM will hunt you down throughout the course of the game, staying your tail until you either clear an area or the bosses self destruct from overheating/damage. There are no rear weapons on the Exohawk so you'll have to think of other ways to inflict damage on pursuing hostiles. The only hope is to fight to the center of the Sigil Empire and eliminate the AI that controls the planet-core tap, which powers the entire nation of Sigil. A disruption in this feed should be enough to drive the planet to critical mass, and considering the amount of gigadeath weapons stockpiled on Ameth, the resulting explosion should eliminate all life within the immediate vacinity.